Read here about furniture, those consumer products, furnishings and other tensegrity-based movable objects that support various human activities such as seating and sleeping in beds, holding objects at a convenient height for work using horizontal surfaces above the ground, or storing things. 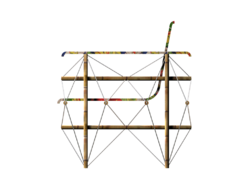 Tensegrity furniture designs are constrained by the conventional design of such artifacts, and their need to accommodate common, expected affordances such as seats, doors, and shelves to contain, organize or just co-exist with other household goods and activities. Waddel 6 strut 713 Cassina table. Designed by Theodore Waddel (b. 1930). 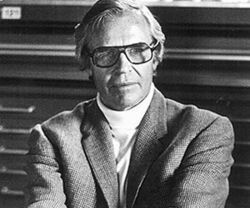 After graduating in Chemistry (1950) and earning a Masters’ in Business Administration in 1951 from Cornell, Theodore Waddell did his Master’s in Architecture at the University of Pennsylvania (1964) and took a first in Architecture at Florence (1968). He practiced as architect and industrial designer in Italy for fifteen years, making a name for himself also as photographer. He returned to the USA and set up practice in Santa Fe, New Mexico, where he now lives and works. Five of his lamps are to be seen in the Musée des Arts Decoratifs in Paris, and two are in the permanent collection at the MoMA in New York; this museum dedicated a special exhibition to him in 1969. The 713/714 Tensegrity tables designed for Cassina have been in the catalogue since 1972. Robby Cuthbert produces the contour table, which won the Editor's Choice at the 2015 Bay Area Maker Faire. For more details, see Cuthbert, Robby. 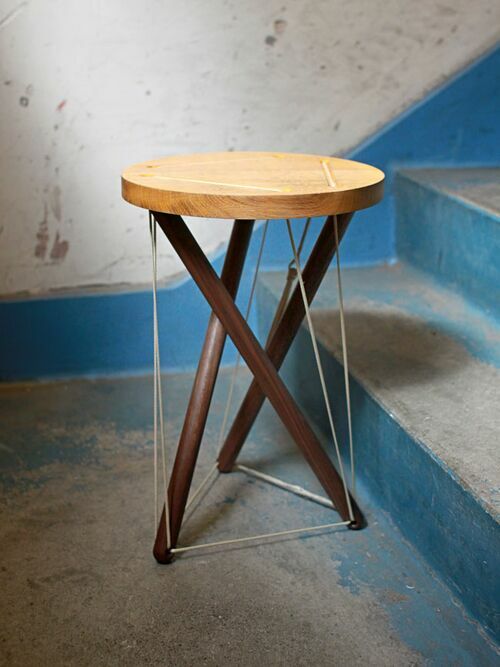 Axel Yberg of Akke Functional Art produces a variety of tensegrity tables. 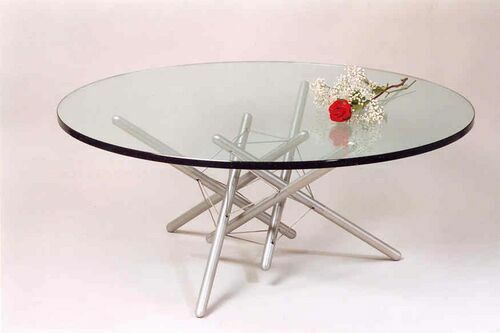 4 strut tensegrity table titled "Reverse Dowry," by Axel Yberg of Akke Functional Art. Richard Koenig markets the Suspend Coffee table. Its specifications are 16" to top of glass, glass top is 40" diameter x 3/4" thick, batons are 1" diameter solid aluminum alloy with a clear anodized finish, cable is 1/8" diameter. He also markets the Suspend Accent table - 17" high to top of glass, glass top 21" diameter x 1/2" thick, batons are 1/2" diameter solid aluminum alloy with a clear anodized finish, cable is 1/16" diameter. 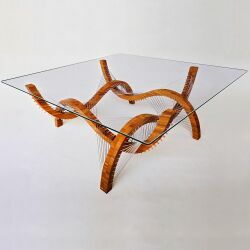 Suspend Coffee Table by Richard Koenig. 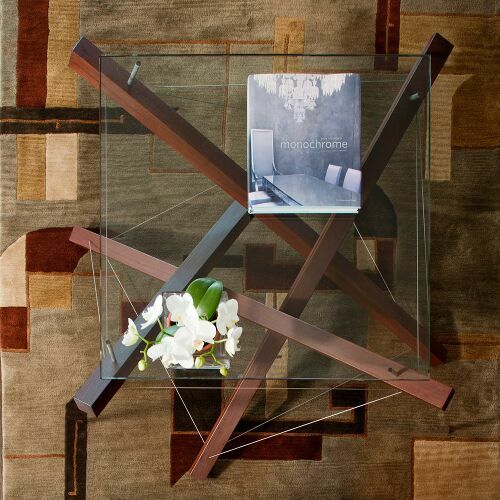 Suspend Accent coffee table by Richard Koenig. The copper development association posted full instructions: see http://www.copper.org/consumers/copperhome/DIY/cu_tensegrity_table.html%7CCopper Tensegrity Table. 2 v-strut tensegrity table, "Masonic Compass", by Tom Flemons. 3 strut "Crutch Table" by Tom Flemons. Click here for more work by Flemons. 4 strut tensegrity prism using four twelve foot poles and very strong cables by WVHammockmaker. Sandro Aiello created a 100 x 100 x 30 cm table. 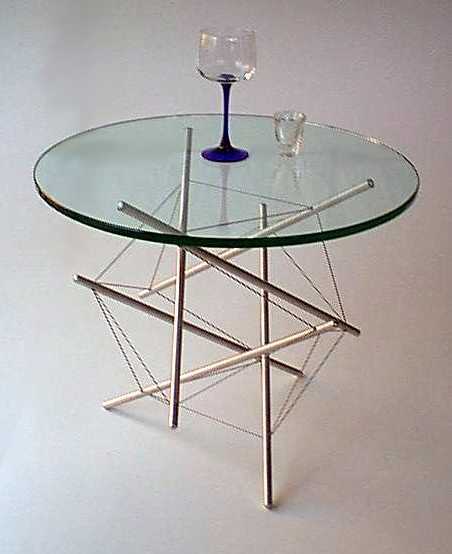 Glass tensegrity table by Aiello. Marcelo Pars published a 42 strut antiprism and proposed its use for an armchair. 42 strut armchair model by Pars, top view. 42 strut armchair model by Pars, side view. 3 strut wavilnear chair, "Suspension Chair," by Tom Flemons. 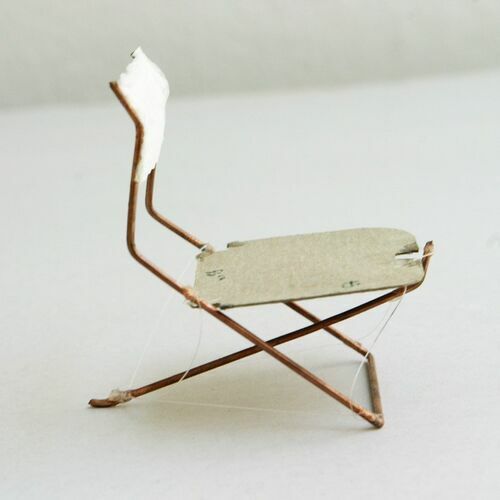 João Victor Correia de Melo created an experimental Tensegrity Armchair from bamboo as part of a masters dissertation to studiy interactions between electronic models and mechanical models applied to the development of construction technology of lightweight utilitarian objects made of bamboo, clay, natural fibers and resins. Armchair Bamboo by de Melo large. Bamboo by de Melo side large. Armchair Bamboo by de Melo plan. See more Achkov designs below, or here. 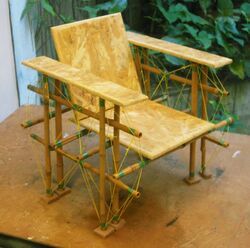 Architecture students at ETS constructed a 6 strut chair constructed of metal struts and a knotted rope fabric seat. 6 strut suspended chair left side by ETS. 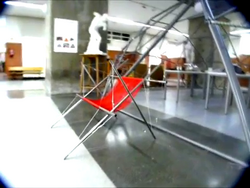 This chair is an experiment in making a flexible folding chair, using a tensile structure. This product is intellectual property of Tectonicus Constructs llc, patent pending and anyone found illegally duplicating this will be found and prosecuted. 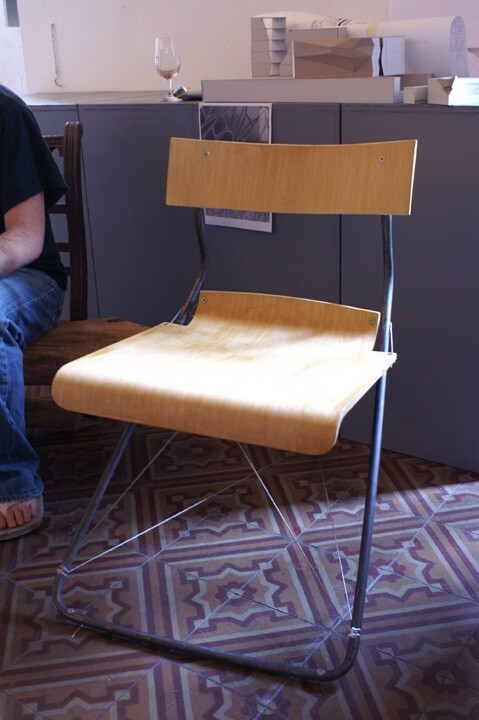 The chair uses common materials, molded plywood, steel tube, and stainless steel cables. The combination of the steel cables, three legs, and plywood make for a chair that flexes as is it sat upon, thus adding a bit of comfort to the folding chair. The design is also fairly lightweight for ease of portability. Tectonius is seeking manufacturers, contact ben -at- tectonicus.com. 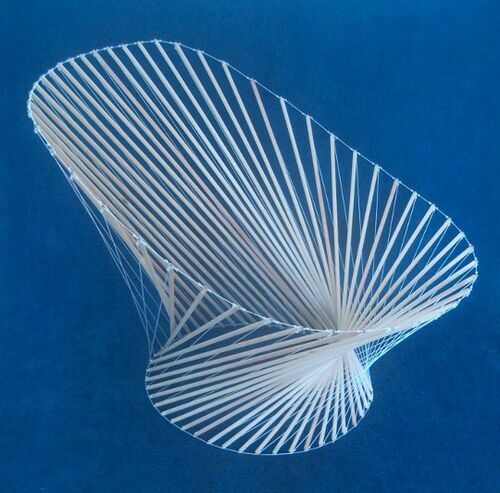 Tensegrity chair mockup by Tectonius. Property of Tectonicus Constructs llc, patent pending. 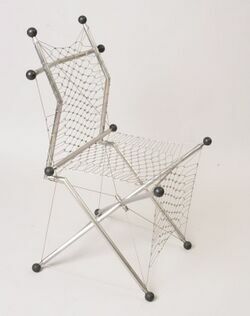 Tensegrity chair, front view, by Tectonius. Property of Tectonicus Constructs llc, patent pending. 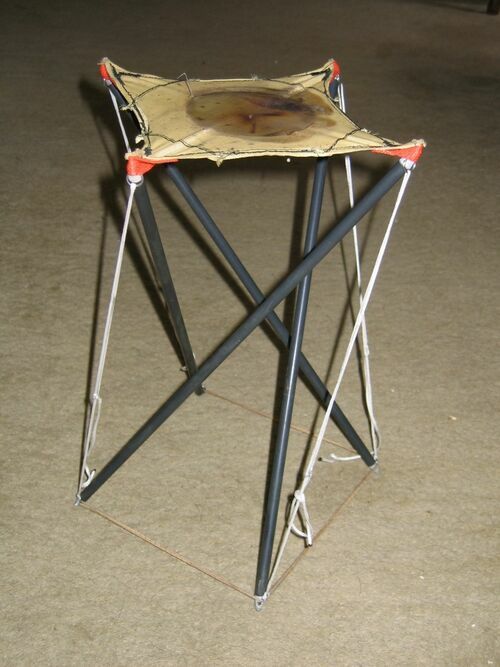 The stool is based on a 3 strut tensegrity antiprism. 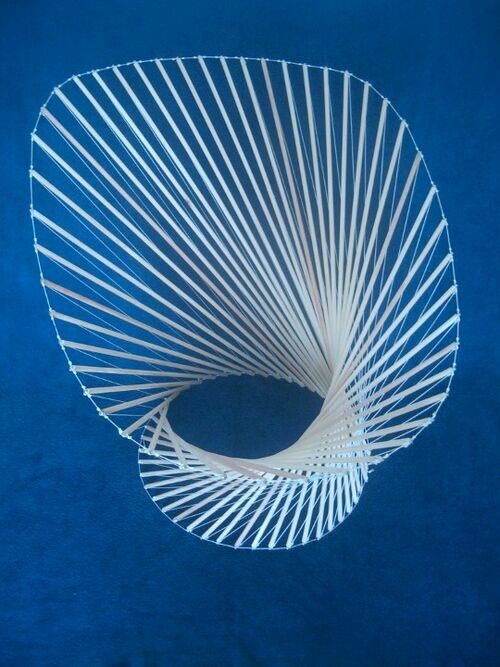 3 strut tensegrity joined to a circular wooden top, "Snelson" stool by Sam Weller. 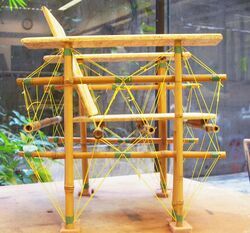 Sushant Passi, Bangalore, India, posted on line a tensegrity stool he designed and developed for the Mathematics of Planet Earth Exhibition in Bangalore to interactively express the concept of Tension and its capabilities in forms, November 2013. 12 strut stool final by Rasmussen. Vishal Wadhwani (b. 1980) was trained at the Ahmedabad, India School of Interior Design, CEPT. He trained in steel and fabric structures at Kakani Associates before opening his own studio, "idea factor." Now head designer, he specilizes in tensile structures, and still has time for research into geodesic domes, tensegrity installations, origami/paper folding, and deployable systems. He also explores combinations of tensegrity & membrane structures to deploy kinetic/wind sculptures, and small kiosks & canopies. Tensegrity frame, ahmedabad. Acrylic, aluminum rods and cotton thread, by Wadhwani. Konstantin Achkov uses tensegrity modules in some of his furniture designs. For more examples, see Konstantin Achkov. Tensegrity based furniture by Konstantin on display at the Bulgarian Bienal: table, chair and stool. V-tense tensegrity table by Konstantin, close-up. Alia Eissa used a 3 strut anti-prism as the basis for a coat hanger. The coat hanger was displayed as "Suspended Inbetween" at the annual GUC exhibit. caption="3 strut coat hanger, Suspended Inbetween exhibit, by Alia Eissa.